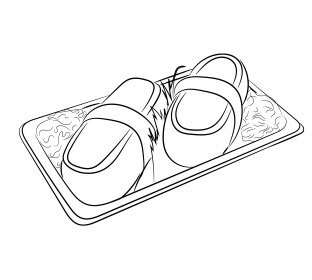 Sushi Socks Box with butterfish nigirizushi and maku tuna consist of 2 pairs of socks which resemble sushi, decorated with wasabi and ginger. Proudly made in Europe. Surprise everybody with unique socks idea! 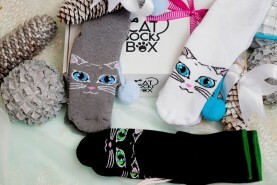 Sushi socks box – How to be rolled?! Sushi socks are an oriental product not only for raw fish lovers but also for fans of interesting solutions and HIGH QUALITY goods.Thanks to OEKO TEX certfied combed cotton cooked in the properly chosen temperature, socks keep their consistency and don’t let your feet overheat or freeze. What’s more, flat stitch Rosso and delicate ribbing are the guards for your legs comfort and protect your sushi roll from falling apart. Carefully selected ingredients of natural origin are always fresh and will regale your feet with wealth of japanese flavours. VARIOUS DESIGNS AND COLOURS – In our menu you can choose from many sets of 10 different compositions: nigirizushi with salmon, tuna, tamago omelette, butterfish and brown, burgundy or red octopus pattern as well as maki with cucumber, turnip or tuna (green, yellow or burgundy colour). So our socks will be perfectly suited to size of your apetite. 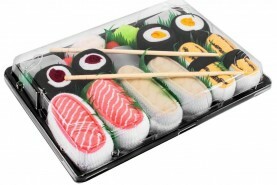 Don’t worry about ginger or wasabi either, these are not missing in our Sushi Socks Box. You’re more than welcome to order sushi in best sushi socks bar in the world! Sushi Socks Box with salmon nigirizushi consist of 1 pair of socks which resemble salmon, decorated with wasabi and ginger. Proudly made in Europe. 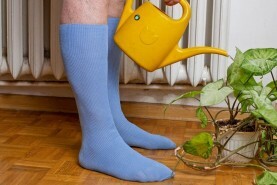 Surprise everybody with unique socks idea! Sushi Socks Box with maki with tuna and nigirizushi with tuna consist of 2 pairs of socks which resemble sushi, decorated with wasabi and ginger. Proudly made in Europe. Surprise everybody with unusual socks! Sushi Socks Box with nigirizushi with salmon and maki cucumber consist of 2 pairs of socks which resemble sushi, decorated with wasabi and ginger. Proudly made in Europe. Surprise everybody with unusual socks! Sushi Socks Box with nigirizushi with tuna and salmon and maki cucumber consist of 3 pairs of socks which resemble nigirizushi, decorated with wasabi and ginger. Proudly made in Europe. Surprise everybody with unusual socks! 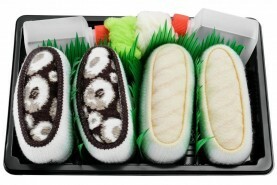 Sushi Socks Box with nigirizushi with tamago omelette and butterfish and maki turnip consist of 3 pairs of socks which resemble sushi, decorated with wasabi and ginger. Proudly made in Europe. Surprise everybody with unusual socks! Sushi Socks Box with nigirizushi with tuna and octopus brown and maki cuccumber consist of 3 pairs of socks which resemble sushi, decorated with wasabi and ginger. Proudly made in Europe. Surprise everybody with unusual socks! Sushi Socks Box with nigirizushi with tamago omelette and salmon and maki turnip consist of 3 pairs of socks which resemble sushi, decorated with wasabi and ginger. Proudly made in Europe. Surprise everybody with unusual socks!